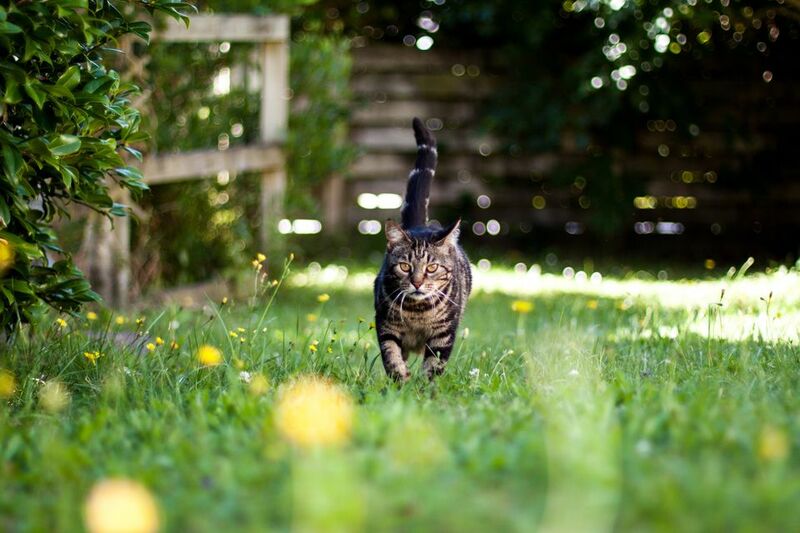 Whether you want to keep your cat out of dangerous plants or wires, or you’re hoping to deter feral ones marking your flower beds and bushes, there’s a commercial cat repellent for every situation. From ultrasonic deterrents to motion-activated sensors to cat-safe bitter sprays, there are many avenues you can try depending on your ultimate goal. If you’re trying to keep cats away from restricted areas outside, you’ll want to focus on an electronic repellent that scares away cats and other critters from your garden or trash cans. When training your pet cat to stay off counters or kitchen tables, an air spray can is a safe, indoor-friendly way to keep them in line. It may take a few tries to find the right method for your particular situation, but we’ve sifted through all of the products you can buy to find the best options for every scenario. The ScareCrow is a motion-activated repellent that sprays a burst of water when it senses an intruder. Great for keeping cats away from your lawn (or for keeping your own cats from escaping enclosed areas), the ScareCrow startles animals by emitting a loud clicking noise and spraying them with a harmless burst of water. Each unit can protect up to 1,200 sq. feet, and uses a single nine-volt battery. You can stack ScareCrow sprinklers in each corner of your property to fully protect your yard. The repeller uses about two to three cups of water per burst, and has the added bonus of watering your lawn while keeping away cats (and other unwanted critters). We love the ScareCrow because it’s 100% safe and a great alternative to chemical products. It also serves a dual purpose (whose garden couldn’t use a little extra watering? ), and deters all types of pests. Reviewers say it works well for cats and dogs as well as deer, rabbits and raccoons. While the ScareCrow looks more like a pelican than a crow, its low profile means it isn’t an unsightly addition. If you’re looking for a cost-effective, reliable product to keep cats out of your lawn and garden, the ScareCrow is our top choice. The Pest Soldier Repeller works by sending powerful ultrasonic sound waves when it detects a living creature in its coverage area. Each unit provides 5,000 sq. feet of coverage, and uses either a standard plug or batteries. To use, simply place the unit against a fence, shed or an exterior wall. You can adjust the sound frequency dial to direct the tone at specific animals, or set it to deter all animals. Most frequencies are too high for humans to hear, though some reviewers note kids can hear many of the sounds. Owners say the Pest Soldier works well for everything from keeping cats away from gardens to deterring pigeons from hanging out in your driveway and trees. Some owners buy multiple units for all sides of their homes, which keeps cats (and other pests) away from every entrance point. The Pest Soldier is a great choice if you want to avoid using chemical products or are concerned about over-watering your lawn with the ScareCrow. We love the PetSafe SSSCAT Spray because it’s great for either indoor or outdoor applications, making it incredibly versatile. The SSSCAT Spray uses a motion sensor to send a burst of air to a detected intruder, scaring away cats from kitchen counters, bushes and gardens. The spray is unscented, and covers areas up to three feet. This device is best used for direct deterrent, whether you’re trying to keep cats out of your trash cans or off of your dining table; it works by covering a small but precise area. SSSCAT runs on AAA batteries, and each can of deterrent lasts about 80 to 100 sprays. Reviewers say SSSCAT effectively keeps both their pet cats from off-limits areas inside and out, as well as stopping feral cats from digging up flowers and getting into outdoor trash cans. One reviewer remarked that it’s perfect for keeping needy kitties away from bedroom doors during early hours. After a few uses, many cats learn from the SSSCAT not to revisit those areas, and some owners did not need to repurchase cans. Flagline is a granular cat repellant that works through smell. Flagline’s Scram for Cats is great when spread in wood chips, soil and around home foundations, and uses a mint scent to keep cats away. While Scram for Cats is safe for indoors or out, it’s best used outside due to the potent smell. If used in areas without cover, you should replace the granules after heavy rain or snow. We love that Scram for Cats is safe for animals and very low effort — simply shake and let it do the work. Reviewers note that it doesn’t work for all cats, but most say it keeps many pests away. Scram for Cats is a great choice for barn owners and anyone looking to keep cats out of sheds and gardens. Though it will need to be reapplied occasionally, it’s an incredibly low-effort and effective way to keep cats away outside. If your couches and tables often fall victim to sharp cat claws, the Fe-Lines Pioneer Pet Sticky Paws is a great product that will keep paws away. Each box comes with five clear 9" x 12" sheets that safely stick to your furniture and deter cats with a tacky feel they hate. The medical-grade adhesive is wood and fabric-safe, but it’s best to test a small corner before you commit to the whole piece. Reviewers say it works well for most cats, keeping them from scratching up leather sofas, new rugs and even from jumping up on counters. Grannick’s Bitter Spray has been around since 1960 when a pharmacist invented it to stop dogs from licking hot spots and surgical sites. While it works when sprayed on various surfaces like furniture and wires, it’s a good bet if you’re looking for a cat repellent that keeps your cat from licking at stitches. It’s non-toxic and non-sticky and tastes like bitter apples — a taste most cats cannot stand. Spray it on troubled paws or fur to keep your cat from obsessive licking (and racking up vet bills). Reviewers say it doesn’t always work on surfaces, and note that it dries fairly quickly — but it is a great choice for fur. While you may have to reapply a few times a day, it will quickly deter your cat from licking and causing harm. Sentry Stop That! is the most “active” repellent on our list, and works by using pheromones to dissuade a cat from any bad behavior. Unlike the other options here, Sentry must be used when you catch your cat doing something bad — either scratching a couch or jumping on a table — and eventually teaches him to avoid the habit. Once sprayed, the mist reduces negative behavior by releasing a natural pheromone and a quiet noise to scare your cat away. Reviewers rave about Sentry, stating that after just a few uses their cats started to change their behavior. If you’re looking for a cat repellent that works well for active training, Sentry is the best you can buy.